Happy New Year everyone! 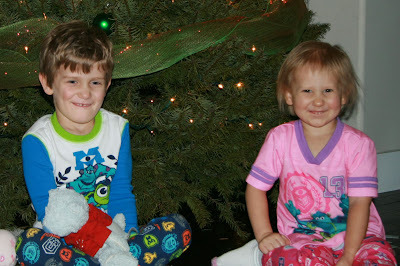 We had a great Christmas, the kids loved every minute of it! Decorating the tree, Elf on the Shelf, Santa, flying to the North Pole to find Santa, presents and more presents, Christmas morning with cousins and playing with friends. It's hard to believe January 29 will be 1 year out of treatment. Liam continues to have MRIs and checkups with his oncologist every 3 months. These are so tough on us, we just get into the routine and almost feel "normal", then 3 months rolls around again. Then we get that dreaded little appointment card in the mail from oncology for the next round. 2013 was a great year. Both Liam and Madison attended Jamie's Preschool for immune compromised children from January to June. This was such a wonderful place for the kids, they loved it so much. We were so fortunate to have had a safe place for the kids to play and avoid the flu season. In March, Aunt Ami came for a visit from Florida! The kids had a wonderful time playing with their Auntie and doing Easter activities together. Thanks to Children's Wish, April was Liam's wish trip to California. We went to Disneyland, Legoland, Sea World and San Diego zoo. It was just such an amazing trip for the kids and us. We can hope that Liam remembers more of this than he does of his time in treatment. Even though Madison was only 2, she loved it too. The biggest trouble was she got SO mad when she wasn't tall enough to go on some of the rides! Both kids loved seeing all the characters. Liam could have stayed in Radiator Springs the whole time, he loved every detail from the Cars movies. Early July, we celebrated Liam's 5th birthday! How emotional for us all! We had a BBQ and party and had a wonderful time at our pirate party. We had a great summer of sun and fun in the Okanagan. The kids loved hanging with Grandma and Alex in their motorhome and playing at the playground at Kin Beach. Liam had a bit of a tough time with the heat, so spent more time in shaded play areas than at the beach. (In August, the temperature is generally around 30C/85F) Liam loved riding with Grandma and Grandpa in their boat on Okanagan Lake. Picnic lunches on the boat are awesome! We're always on the lookout for the Ogopogo, but haven't seen him yet. September was a big milestone when Liam started Kindergarten. Kindergarten is 9:00-11:45am daily, with quite a few Fridays off. Liam is doing great and loving Kindergarten. Liam is getting extra help from speech therapy, and from O/T with his pencil/fine motor skills. Liam requires some extra help in completing tasks, fortunately, the Kindergarten class has a wonderful assistant. Liam plays soccer every week and loving that. It's great to see him running and getting stronger all the time. Liam also participates in PEER, a program by Kids Cancer Care. The focus is to help kids recovering from cancer treatment restore their strength, balance, etc, with a program designed by exercise physiologists. Madison is in preschool in our community. She was a bit hesitant to go alone, but now she is loving it. She is going to start a dance class soon, we'll see how she likes that. She turns 3 this week, she's no longer a baby! Troy continues to enjoy playing soccer. He plays outdoor soccer in the summer and indoor in the winter. This summer his team won provincials, very exciting! Thank you to everyone who gave us support and good wishes through 2013. We wish everyone a wonderful 2014!